why to wear a Go Green Tee - GGI-Group size: 4000+ Professionals, Increasing on day to day basis, Come & join us 2 serve Mother Nature. It’s a general notion in our country, when someone who spots a cyclist they feel He/She is cycling either for fun or they cannot afford to buy motor cycle/car hence riding bicycle. If the same Cycle when they wear GoGreen-Jersey, They pass on a clear message that He/She is cycling for a cause. The print on the Jersey is self explanatory and doesn’t require any briefing on the cause. 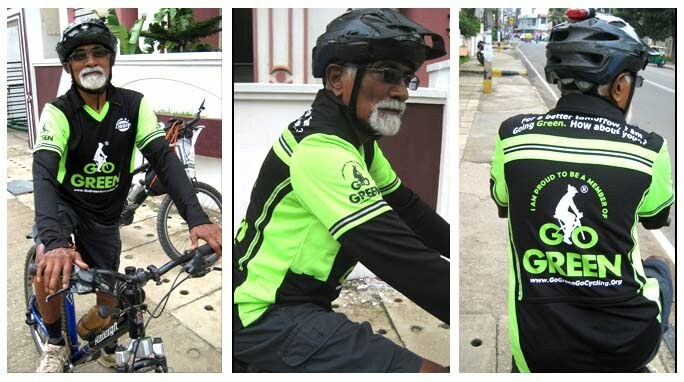 YOU GET BACK U'R RESPECT WHILE U WEAR THIS GO-GREEN Jersey & RIDE CYCLE.. IT'S A TOOL THAT MAKES OTHER'S 2 FEEL GUILTY & WILL OPEN UP THEIR MINDS 4 SUPPORTING OR CONVERTING FROM MOTOR VEHICLE TO CYCLE..
One can ensure to pass on a clear message of “Going Green for a better tomorrow"
Cyclist being honked from behind & specially a Lady cyclist experiencing/encountering by eve teasers are common problems on our streets but however The same can be addressed by wearing a GoGreen-Jersey hence People would think twice before they do such things.